When I first set foot in the city of Warsaw, I needed to find two things: my apartment and some live music. With everyone back home asking ‘What’s even in Warsaw?’, I can now confidently say the capital of Poland has venues for every genre and aesthetic you could ever want, as evident from these top-notch music joints. The beautiful thing about the music scene in Poland’s capital is you can find artists performing in English, Polish and even both in one set. The best advice I can give as an American who only knows ‘dzień dobry’ and ‘dziękuję’ is to EMBRACE FOREIGN LANGUAGES. Don’t shy away from a show if they don’t sing in your language. Even if you can’t understand the words, the emotion behind a song shouldn’t have to rely on you knowing Polish. Even getting the opportunity to witness a Pole perform in their native tongue and seeing how comfortable they are in the spotlight is a privilege. On another note (no pun intended), Warsaw has a plethora of instrumental combos from improvisational jazz to classical quartets (it IS the city of Chopin, remember). In my brief two months attempting to make my way in this city, I have seen so many great musicians who let the music do the talking so if the language barrier is a serious issue for you, you have options. My other piece of advice for finding live music in the city is to browse Facebook for events. We live in the 21st century. No one is going to hand you a flyer while walking through Centrum for their small bar show across the river. You have to actively search for these bands. Most businesses and venues will make the show an official event on Facebook to gauge numbers and attendance. Save as many as you want for a night and choose one or two you’d like to check out. Warsaw is a huge city. Explore the possibilities. As I attempt to group venues and explain why I think they’re all superb places to catch some tunes and experience the Warsaw vibe, remember I’m only one foreigner. I wasn’t able to get everywhere in two months. And if you’ve had an awesome concert experience? Post about it in the comments! Spread the music! Nothing feels better than sitting back after a long week of work, grabbing a top-tier beer or cocktail and catching a band. Warsaw has a tonne of bars but for live music, you can’t miss these. My first week in the city, I strolled over to the Palace of Culture and Science and immediately discovered two classic venues I would continue to visit for the entirety of my time here. 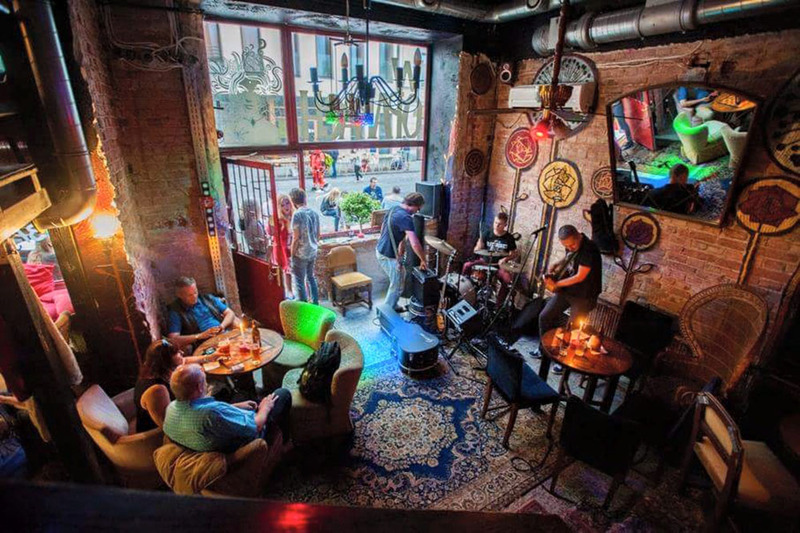 Barstudio and Café Kulturalna have fully stocked bars, solid selections of homemade drinks and stunning architecture to boot. 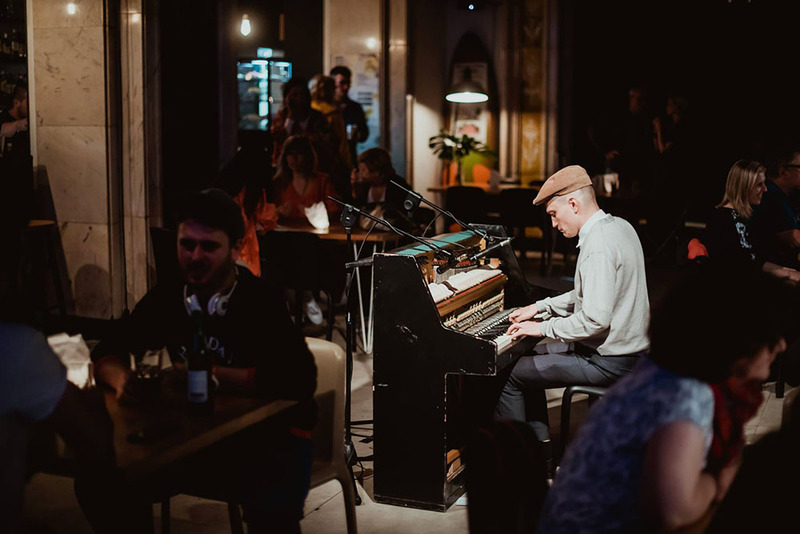 I’ve seen a solo ragtime pianist illuminated from spotlights at Barstudio and DJs spinning electronica, dance and even modern rap at both venues. While Barstudio has a cool and bumping patio for warmer nights, Kulturalna has the intimate feel of a club without the huge line. Both locations are a perfect recipe for the adventurous foreigner who wants to meet people over music and drinks. As for the awe-inspiring design, above Barstudio is the Studio Theatre, while Kulturalna shares a lobby space with the Dramatyczny Theatre. What makes both venues special is they don’t attempt to distinguish themselves from the beauty of a theatre with large columns and decorative arches. Instead, they embrace it. The surroundings may not fit with a thumping bass and sharp hi-hats DJ set at first, but it grows on you for sure. You’ll have to visit to see for yourself. Like Barstudio and Kulturalna, Miłość Kredytowa 9’s versatility in location can adapt to any vibe. When I first strolled up to Miłość to see the Hypnotic Brass Ensemble, I walked into a beautiful garden patio area with a stacked bar at the back end. Since then, I’ve seen more DJs in this natural space but apparently, concerts with bands have been set up in the garden too. However, Miłość also has a long wooden-floor dance hall area with a full stage and lighting setup in an adjacent building for larger shows. Don’t worry, there’s a bar up there too. When the crowd filed in, the second stage area became a close-knit concert venue that just happened to have an amazing drink selection and a seating area as well. A must for someone looking for both a patio bar and an actual larger concert vibe. As for jazz, I highly recommend 12on14 Jazz Club on Polna. Like the best jazz clubs all over Europe, the jazz lies underground down a staircase from the lobby and has a large amount of seating, so going with a group is not a big issue as long as you can find space together. If you’re just heading out solo for the night (like I was), not many people sit up in the front row – if you can grab a seat at the sides of the front, you’ll have a personal view of the musicians and solid sound. Like all the other venues in this group, around the corner from the stage is a long and packed bar that can cater to any of your drink and spirit needs. I would definitely vouch for a jam session hosted at 12on14. The musical calibre is 10/10 and the performers are so talented, some even switch instruments for songs. Go ahead and unleash your inner Kerouac, grab a drink and sit back for a night of versatile jazz. If a European tour is going to stop anywhere in Poland, it will most likely be Warsaw. A primarily metropolitan population, Warsaw has the large venues needed to cater to them and their droves of European fans. If it’s touring bands you want, it’s touring bands you’ll get with these spots you physically can’t miss. Let’s get the largest one out of the way first: The National Stadium. Meant for massive touring operations, here is where you will finally get to see your musical superstar idol. I use the word ‘see’ lightly because unless you have the ability to shell out all of your złotys, you will most likely be in the nosebleeds. However, the large LED screens will make sure you have a good view, albeit through a screen. Having been to many stadium shows back home, I see stadiums as basically the opportunity to hear a new live album. You won’t have a great view but the sound will travel very well up to your seat. Just enjoy the positive concert energy around you and think about how good the sound engineering is. Get ready for a certified concert-goer pro tip! For the rest of the venues in this group, you can feel free to try out my favourite method of enjoying a concert to the fullest. Obviously, if it’s a standing-room show and you really want to see the band and have an uninhibited view, just get to the show early. Wait in line, do whatever you need to do with drinks and bathrooms once you’re let in, and then run to the front. Most of the time, a waist-high gate separates the audience from the stage and nothing is better than being able to rest over the bars in between sets. Also, if you’re against the gate, no one can get in front of you and block your view, which eliminates the awkward language barrier conversation of trying to explain to someone you can’t see. If this doesn’t work or you don’t care about being up front, here’s my tip. Make your way to the sound booth and stand right next to it. Most likely, no one will be crowding you depending on where the booth is. You should chill here because it’s where you’ll get the best mix of the instruments. Think about it, if that’s where the sound engineers are mixing from, they clearly have the best auditory experience of the concert as opposed to someone who is hearing a weird mix but is in the front row. You’re welcome. In my humble opinion, Progresja is the most similar place on this list to a US live music venue so I felt right at home. However, Stodola and Palladium have the same setup and are both great options for an intimate yet larger show. Standing room only tickets, elevated stages and a full-fledged sound board are a recipe for a bonafide concert experience featuring all genres and fans. Overall, keep an eye on the concert schedule for these venues because high-profile shows are announced all the time with bands from all over Europe and even the world slated to play. I have to mention Niebo here too, which despite its smaller size, totally has the feel of an upscale major venue. Right across the river, Praga (my favourite neighbourhood for smaller shows) has one large venue that I’d highly recommend for its industrial and large-scale festival vibe: Soho Factory. Although I prefer to stand at shows, this fancy factory sometimes puts on a great and relaxing concert-going experience with an assigned seat. This gives you the freedom to go grab a bite to eat, a drink and even to go to the bathroom without fear of losing your spot in a large venue like this. If you can, feel free to use my aforementioned tip and move up a little closer to the sound board. Obviously, there are pros and cons to assigned seats, but the slick aesthetic should ease some of your apprehensions. As the Lovin’ Spoonful said: ‘Hot town, summer in the city.’ In the hottest months of the year, you might be craving a cool drink indoors. Well once the sun goes down, Warsaw nights are the perfect temperature to still enjoy a drink and listen to music outside. Take advantage of the heat with these outdoor venues. While the club inside is very cool with great DJ sets, the patio and swimming pool of Klub Iskra in Pole Mokotowskie makes this venue a great option for summer music. Beach chairs are everywhere for chiller concerts and you could even bring a picnic blanket if you wanted (there is even a swimming pool!). But when an electric and high-profile act is billed, the lawn is suddenly standing-room only. The lighting is surprisingly good for an outdoor spot and there’s a bar to the back of the crowd so you don’t have to go inside to grab a drink. If you expect it to be a seated show, I would recommend bringing a jacket or something small to leave on your chair so you still have the freedom to walk around, say hi to friends and stop by the bar without losing your seat. 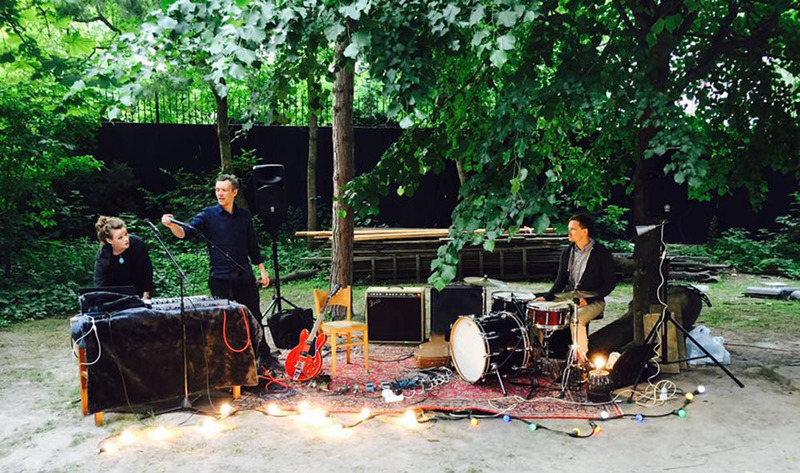 Moving more towards the indie side of Warsaw, Ladom and DZiK are my two favourite choices in this group mainly because they are extremely intimate and cosy and boast beautiful outdoor environments. I especially love supporting Ladom because it’s created by a Polish alternative record label (Lado ABC) that puts on shows in this little shack in the city. If the house is too crowded, you can still hear the music perfectly from outside the house, with people sometimes even dancing on the deck. Christmas lights are strung everywhere, looking like an indie pop dream. DZiK, while included for its music, also has great lunches and other events such as yoga, workshops and private events. At night, however, the old hunting lodge venue lights up and is stellar for outdoor entertainment and music. Just because a venue is outside, doesn’t mean it can’t look and feel like a fully-fledged venue. Plac Defilad and Plac Zabaw are exhibits A and B here. Full outdoor stages with lights and sound systems draw larger bands and huge crowds all throughout the summer. 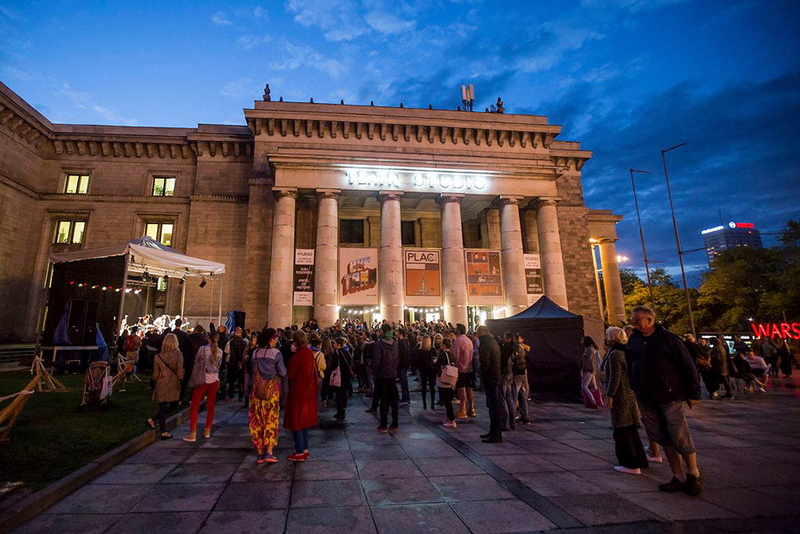 Tonnes of genres are represented at these venues, from Defilad’s weekly Mozart performances to the weekly concerts and out of the box performances during the Lado w Mieście festival at Zabaw (also Lado ABC) and everything in-between at both. If you’re making your way through this list, Defilad is a great place to hit because it’s directly in between Barstudio and Kulturalna. Plac Zabaw, however, is by the river - and there is nore than plenty to see (and hear) by the Wisła! As you can see, many of these venues are pretty close to each other, so make sure you plan your night so you have options around each other. Embrace the heat and the music it offers! I have felt so at home while abroad at the bar W Oparach Absurdu. If you go on a normal night, beautiful carpets and chessboard tables invite you in. If you listen closely, you can hear American blues being played over the speakers every now and then. But when Absurdu really lights up is when there’s a band playing on the little landing leading to the upper level above the small and quaint bar. 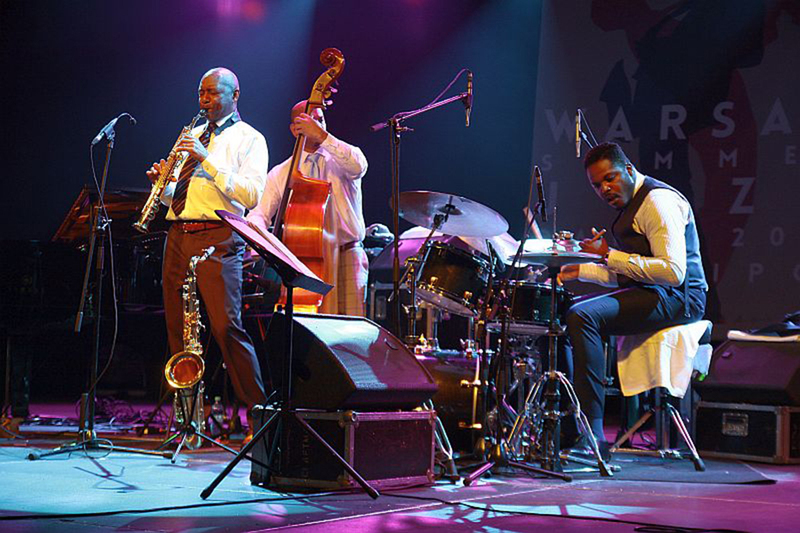 Jazz combos, guitar duos and more have graced the Absurdu’s ‘stage’ and every time, it’s always paid off to go. Their selection of craft beers from all over Poland and beyond is just one of the hundred reasons to visit. You will definitely not regret it. Sitting right by Hydrozagadka, Chmury acts as a café, flea market and concert venue all rolled into one. It just depends on the day and time you go, which I think adds to its versatility and shows how multidimensional Praga can be as a neighbourhood. Like many places in Praga, craft beers are a staple and Chmury is not an exception. The venue inside is a perfect spot to catch a DJ set or a punk band, and meet people from the area. That just leads to new venues and new concerts for you! That’s all I’ve got. Warsaw’s a big city so I definitely missed some. What’s your favourite venue in the city? Why? Post about it in the comments!